The Greatest Showman, starring Hugh Jackman, tells the story of the creator of the circus, P.T. Barnum. With the Oscars coming up in a few weeks, there is already a plethora of spectacular movies out now. Even though you might be more tempted to see one of the Best Picture nominations, or better yet, just stay home and watch Netflix, Newsprint has a different suggestion. Go see The Greatest Showman. Sure, it may have had a slow start at the box office, but it is quickly picking up steam. This is no surprise, as it consists of a star-studded cast a (including Zac Efron!) and beyond catchy music. Take a chance on this Golden Globe-winning film. I promise you won’t be disappointed. 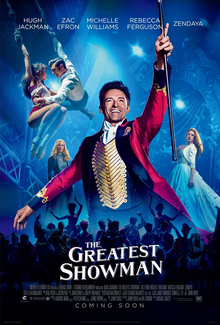 The movie starts off with a little background on P.T Barnum (Hugh Jackman) and his future wife, Charity (Michelle Williams). Although Barnum struggles through childhood as a poor orphan, he always keeps in his back pocket a dream for a better future. This dream has to be put on the back burner for quite some time, however, as Barnum gets married to and has two kids with Charity. Eventually, Barnum breaks free from the monotony of his 9-5 job and pursues his dream by opening the circus. What starts out as a ridiculed “freak show” begins to grow, due to the dedication of Barnum and his family. As the newly minted circus rises in popularity, Barnum begins to lose sight of what led him into the business in the first place. Fortunately, with the help of his employees, Barnum discovers the impact his circus has on people’s lives and rededicates himself to the business. Inspired by a true story, this film is given a deeper meaning by heartfelt performances from the stellar cast. Lead actor Jackman brings to life Barnum’s inspiring rags to riches story through his heartfelt acting. Through this, he makes even simple moments, like singing with his family on the roof of their apartment, seem purely magical. Jackman also does a skillful job of expressing the relentless enthusiasm of Barnum. Even when the circus is off to a slow start, Jackman keeps an enthusiastic smile on his face, thus portraying Barnum’s dedication. Jackman is versatile enough, however, that he’s able to let his grief show in a subtle yet perceptible way when times get tough. Additionally, Barnum’s business partner Philip Carlyle (Zac Efron) does just as memorable impressive of a job portraying the ups and downs of the circus biz. From his reluctance to join Barnum’s circus to his loyalty to the circus cast, Efron’s raw emotions are visible in each and every scene. Even more compelling is Efron’s on-screen chemistry with Zendaya, who plays trapeze artist Anne Wheeler. The scene where they sing the heart-wrenching “Rewrite the Stars” is filled with mind-blowing stunts, yet the audience can still clearly see their conflicting emotions of love and fear throughout the performance. Making acting like this even more astounding, the soundtrack from this musical is simply phenomenal. Written by award-winning La La Land songwriters Benj Pasek and Justin Paul, the soundtrack was bound for success, and it doesn’t disappoint. In fact, the song “This is Me” was brilliant enough to snag the Golden Globe for Best Original Song. Keala Seetle’s raw and powerful voice expresses the uplifting theme of this song—accepting each other’s differences. This is not the only song that breathes life into the movie. “The Greatest Show” captures the essence of the film with its bright, energetic rhythm. Even the more simplistic song ”Never Enough” is just as captivating, thanks to the beautiful voice of Loren Allred. These songs, along with the rest of the soundtrack, make The Greatest Showman a musical that enchants, rather than bores, its audience. Finally, the directing by Michael Gracey pulls all these wonderful aspects together into one quality movie — Gracey’s first. That fact is obvious, however, as the choreography, singing, and acting smoothly blend together under his direction. The Greatest Showman wouldn’t be as enthralling of a movie without the inspiring themes it portrays. P.T. Barnum’s circus is a place for those society deems “misfits.” From a bearded lady to acrobats, each and every member of Barnum’s cast has a unique feature or skill. Instead of looking down upon each other, the members of the circus grow closer and build relationships thanks to their differences. Through themes like this, The Greatest Showman teaches a young audience that it isn’t just enough to accept each other’s differences, rather these differences need to be celebrated. This uplifting message, along with outstanding acting, songs, and directing, truly make this movie the greatest show.